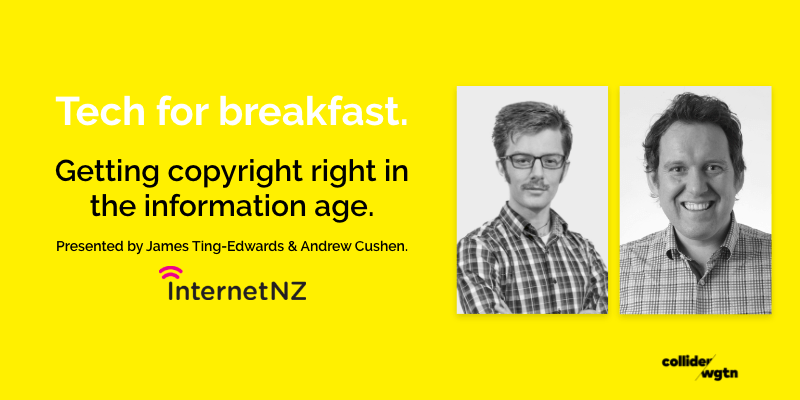 Tech for Breakfast: Getting copyright right in the information age. Did you know our Copyright Act is over 20 years old? A lot has changed since then - like we have the internet! With rapid information access and sharing as well as recent developments in cloud computing, text and data mining it's time for a review! This is underway and being led by the Ministry for Business, Innovation, and Employment. 8.45-9.00 - more questions, chats with your new friends, then go to work! Andrew is the Outreach and Engagement Director and leads the Community, Events and Communication teams at InternetNZ. Andrew has worked for InternetNZ for four years and has had more than 15 years experience working within the Internet sector. He believes that the community funding InternetNZ provides to promote research and discover new ways to improve the Internet is vital. He is proud of InternetNZs engagement with the growing Internet community at events like NetHui. In his spare time he collects Lego, drinks craft beer and loves his cat Carlos like a brother. James Ting-Edwards, Senior Policy Advisor, InternetNZ. As a member of our Policy Team, James works on projects that support a better Internet across our focus areas of access, trust, and creative potential. He has led our recent work on telecommunications regulation, updating copyright law, and the Trans-Pacific Partnership. In his free time, James practices his Mandarin and performs on-stage improv with the Covert Theatre. Please note: This event is at our new site At 3 Market Lane. InternetNZ promotes the Internet's benefits. We protect its potential. And we focus on advancing an open and uncaptureable Internet for our country.